There are a number of references to shapes in Joe and the Camera. Here are some basic ideas to adapt according to the age of your class. Design a party invitation for your ‘shape’ party and create a shape menu. Design and make a shape hat with circles and lots of different polygons. Design a meal on a paper plate. Model the food from clay, plasticine etc. All the food must be square, circular or triangular … or if you are very clever, hexagonal or pentagonal. Remember we are talking about 2-D shapes so we are just thinking about the face of the food. Have a shape hunt around school looking for both 3D and 2D shapes. Burglar alarms are a good source of pentagons and hexagons. Seek out 3-D boxes; triangular prism Toblerone, polygonal Smarties tubes and cheese triangle boxes, square pyramid fererro rocher and cuboid chocolate boxes. Cubes are hard to find. These boxes can be deconstructed and taken apart to find their faces (the sides). For example a toblerone box has 2 triangles and 3 rectangles. 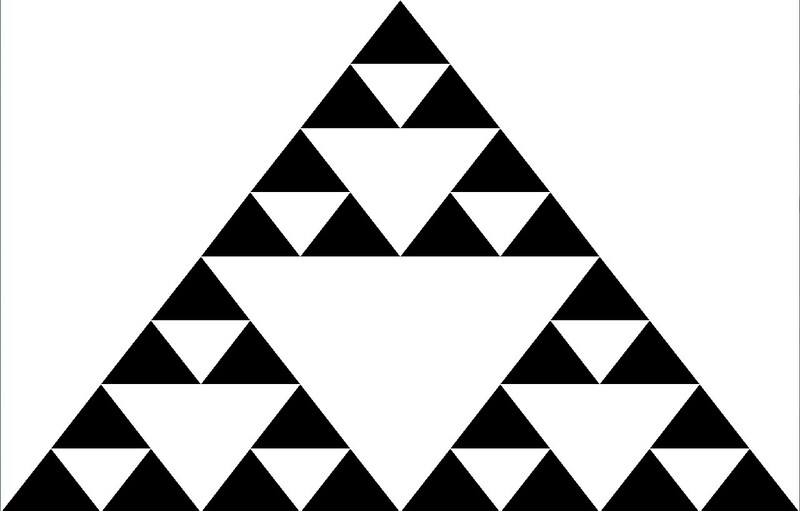 This sequence is made from a pattern of dots which form a triangle. By adding another row of dots and counting all the dots the sequence is developed. This can be built up with coloured paper cut into identical equilateral triangles. It makes an impressive wall display using plain and patterned paper. With Christmas paper this could take the form of a large Christmas tree.